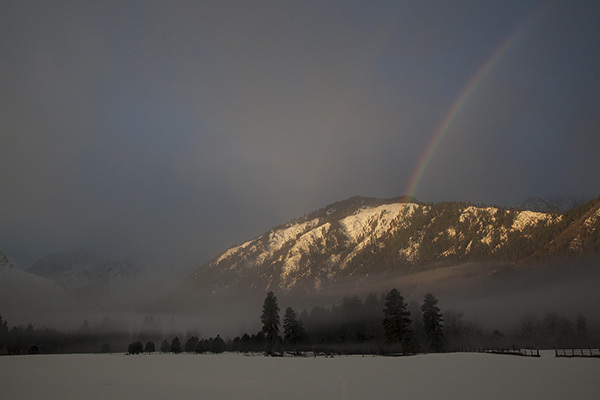 The other morning, as the fog was lifting, we looked across the Leavenworth valley to see a rainbow over Icicle Ridge. I don’t know that I’ve ever seen a rainbow here in February before. The temperatures have been unseasonably warm this month and mostly dry with no snow for over a month. Very unusual. This entry was posted in Uncategorized and tagged Enchantments, Icicle Ridge, Leavenworth, mountains, rainbow, snow, Washington, winter. Bookmark the permalink. Follow any comments here with the RSS feed for this post. Post a comment or leave a trackback: Trackback URL.